It can be difficult to get started in interdisciplinary fields like the digital humanities, since people and resources are sometimes fractured and spread across different departments, schools, and even institutions. As a new staff member, I encountered this problem first hand. I often needed to know about the happenings in digital humanities around campus, but struggled to find out what goes on outside of my own department in the library. Since I am a member of the Office of Digital Research and Scholarship (and since we are always trying out and teaching digital research tools), I decided to use Gephi to solve this problem. Gephi is used to create network graphs—visualizations that show connections between different things. The “things” that we are trying to connect are called “nodes” and the connections themselves are called “edges.” Scott Weingart’s excellent “Demystifying Networks, Parts I & II” provides a detailed overview of the terminology and logistics of networks. In the context of my project, the “nodes” are people, projects, and places on FSU’s campus. The “edges,” lines, connect people to places and projects, and projects to places. All this data was compiled into two separate comma separated value (.csv) files: one that described the different nodes, and another that showed which nodes were connected to each other.¹ I then uploaded these files into Gephi’s data laboratory. Gephi automatically generated a very simple, grey, and bland network graph. I then edited the view so that nodes displayed different colors depending on what type of node it was. People are purple, projects are green, and “places” (departments/discussion groups) are red. I then changed the display so that the nodes were generally evenly spaced, which allowed for better visibility.² I also made the node labels visible, which allows you to see the names of the different entities in the digital scholarship environment at FSU. And here’s what the graph looks like! 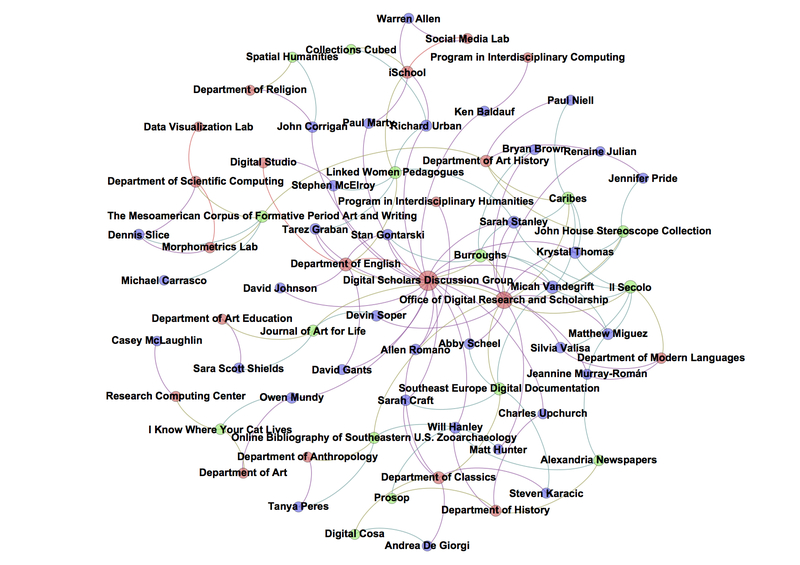 If you are interested in starting a digital research project, but find this visualization overwhelming, please stop by the Percolator: our “Digital Scholarship Support Group”, every Wednesday from 3-5 on the lower level of Strozier in the Technology and Digital Scholarship suite. The Percolator is an informal space to workshop project proposals, explore new tools, and discuss issues in the field of digital scholarship. FSU Libraries’ newly formed Office of Digital Research and Scholarship (DRS) provides support, infrastructure and consulting for technology-focused research projects in the areas of digital humanities, academic/digital publishing, data management, and more. We are focused on connecting people to people, building collaborative research partnerships across campus, and providing platforms for new forms of scholarship. Visit lib.fsu.edu/drs for more information. ¹ You can find the .csv files for this document here. ² I used a layout based on the “Fruchterman Reingold” algorithm, if you are looking to generate a graph like this one. ³ Are you doing digital work at FSU and not yet on our list? Add yourself here!